In Mark chapter 5 we find the story of Jairus and the woman with the issue of blood. We find two people who were in desperate need of a miracle. Also we see at the beginning of the story that as Jesus got off of the boat that a huge crowd gathered around him. People were crowding Jesus so much that he could hardly get off the boat. And as he made his way through the crowd, Jairus came to him, as he made his way through this swarm of people, and fell on his knees before Jesus and asked him to come heal his daughter who was at the point of death. Then as Jesus was making his way to Jairus' house we see that a woman with an issue of blood made her way through a crowd ,and eventually having to get on her knee so that she could touch the hem of his garment. They both were people who had to push their way through the crowds to get to Jesus, to get to their breakthrough, to obtain a miracle. We use the story of the Lady with the Issue of Blood and the Icon that depicts this story quite often at the Skete to push through the crowds to touch the hem of Christ's garment in intercession for a loved one. 1. Healing: the man lowered through the roof by his friend (MK. 2:1-12) Jesus listens to the prayers of friends. 3. Hand - the man with the withered hand (Mk 3:1-6). Iʼve been praying this for James. "God our Father, we press our open wounds to the precious wounds of Jesus, your Son, that your will and ours be one. Through these shared wounds, may we be healed, and bring your healing love to others, that all may be enriched in fulness of love, through Jesus, the Divine Humanity." Amen. Fr. Gabriel says " The Rosary is not simply a prayer for healing, it is a healing prayer, a prayer that heals. In other words, when we pray the Rosary we experience the healing Jesus is." faith to receive the healing you wish to give me through this rosary." "There's healing in touching the very beads themselves, a lowly healing maybe, yet something basic and instinctive. When all around is collapsing and the center cannot hold, it is something to latch on to...Something to hold onto, indeed. But more importantly, someone to hold on to! It is the Nurse of heaven who holds the other end of the golden string." "Jesus, Son of the living God, I desire to recall the memory of your healing life, death and glory. Through the power of your saving mysteries, touch every area of my being. Let my coming into this world be renewed by your own birth at Bethlehem. Let your precious death remove from me all fear of death. Grant me to know the power which comes from your glorious resurrection and ascension into heaven. Through the grace of these Rosary Mysteries, touch every area of my life and be Lord of all that I am and all that I have. 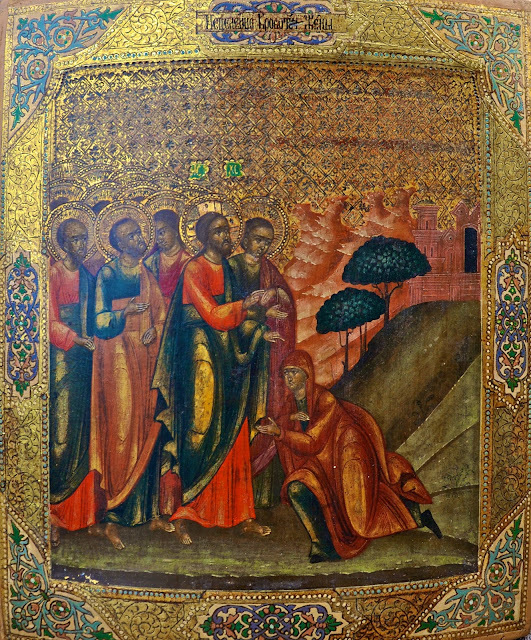 In the Icon featured above, they do not show the crowd that the woman pushed through to touch the hem of Jesus' clothing. It is a method of iconography to allow some details to the viewer while the iconographer writes (paints) only the focal points of the scene. Labels: 3 Strand Rope of St. Simeon Skete, Fr. Gabriel Harty OP, Nazareth House Apostolate., Riches of the Rosary, St Simeon Skete.